Today, I added a print to my collection. 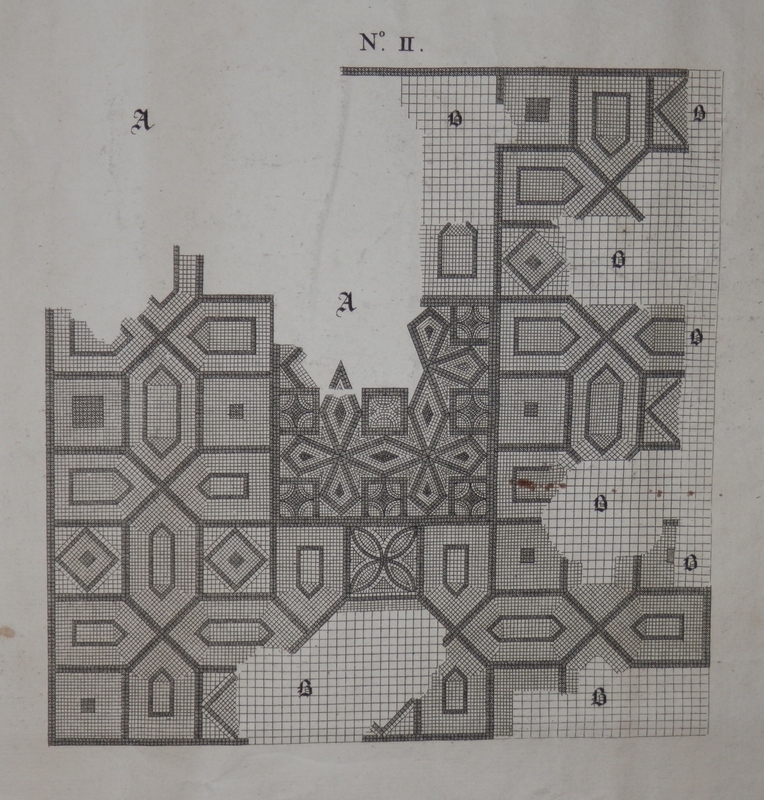 A print which was made in 1738. Not bad, a couple of small tears – repaired but nice overall. It was engraved by J. Cole (1715-1774) after a picture by John Lens. 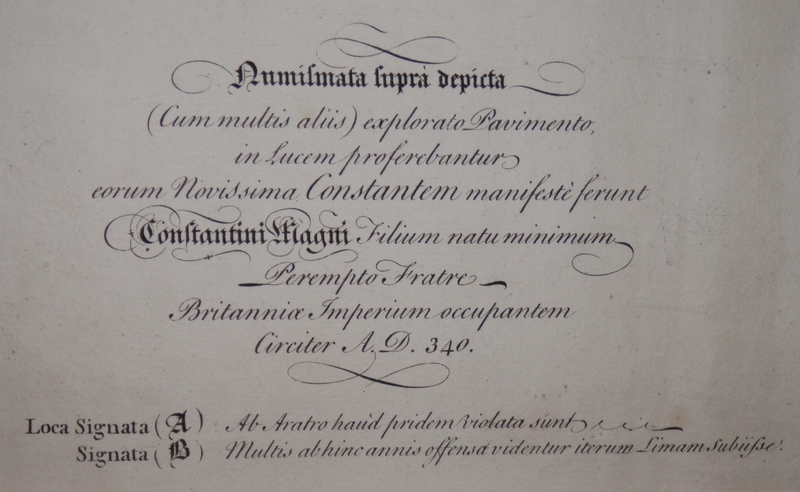 I, firstly, give you the complete image which will be followed by several images of smaller sections of this engraving. 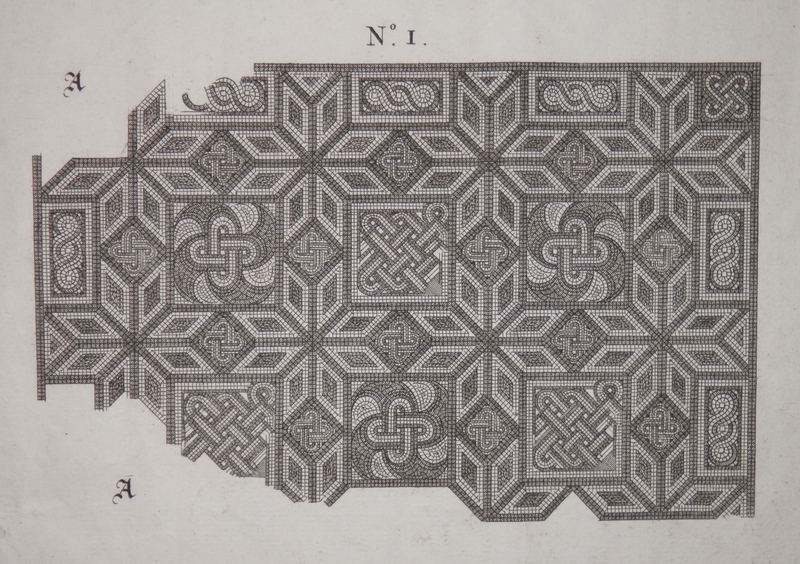 This print is of #WeldonRomanVilla mosaic floor from the year 340 AD. The site of the villa and its’ floor were partially excavated in 1738 and then again in 1954. Nothing of it can be seen now-a-days. The overall image is the centre top while all the others are expanded insets of various parts of the buildings floor. 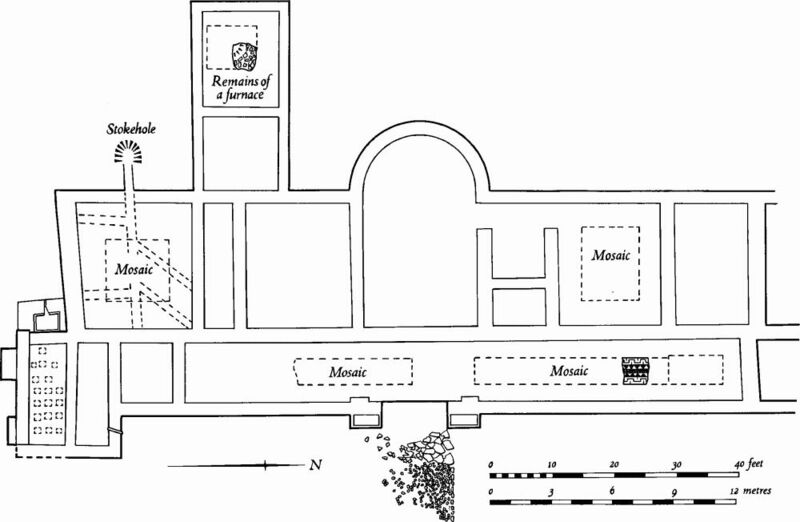 I also show an image of the Weldon villa floor plan which I have borrowed from british-history.ac.uk. The scale under the main image informs me that the length of the main floor would be roughly 90 feet. This would make the long lower inset some 40 feet. Although my image is in black and white the floor most likely would have been very colourful and the long hall itself quite impressive. For those of you who are Latin experts, I would appreciate an accurate translation of the following two images. These two written descriptions name George II as king and also name Gulielmus Vicecomes Hatton (Viscount (Christopher) William Hatton). Christopher Hatton, the 2nd Baron Hatton of Kirby, was created Viscount Hatton of Gretton in 1682. 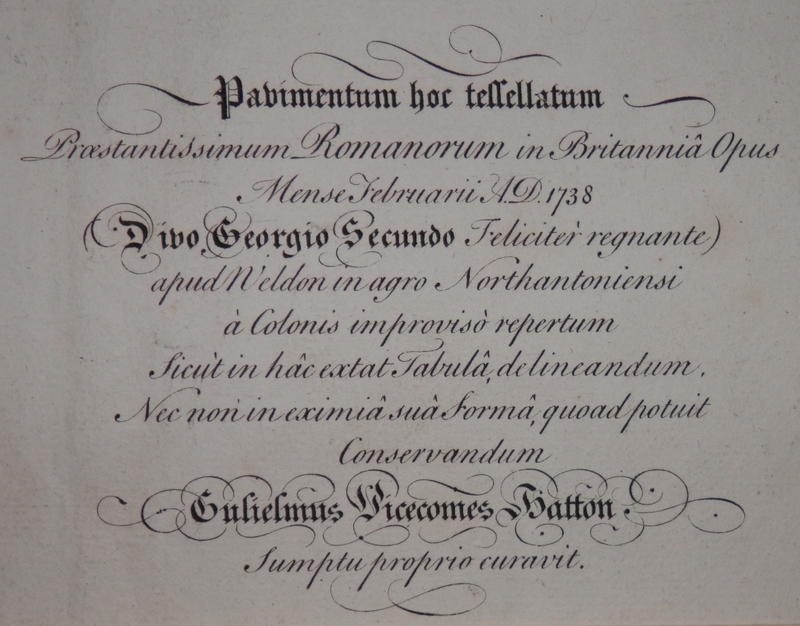 The title was inherited by his eldest son and then by his youngest son. The title became extinct in 1762. The following image is of the ‘Coat of Arms’ at the centre bottom. 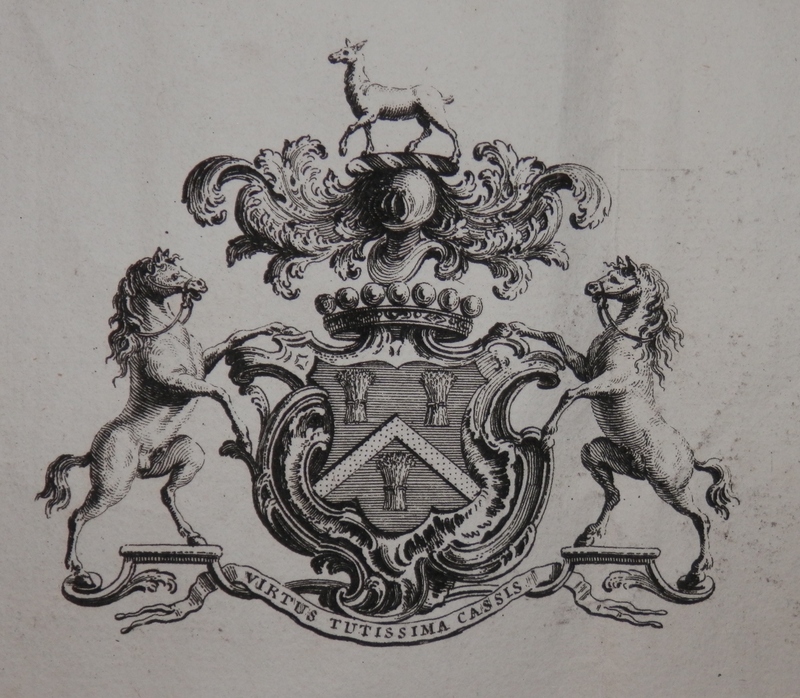 It is of course the crest of the #Hatton family. The translation of the Latin is ‘Virtue is the safest helmet’. And to finish off a couple close ups of the insets. A stunning and impressive floor, I do hope that it exists still but I do not know. 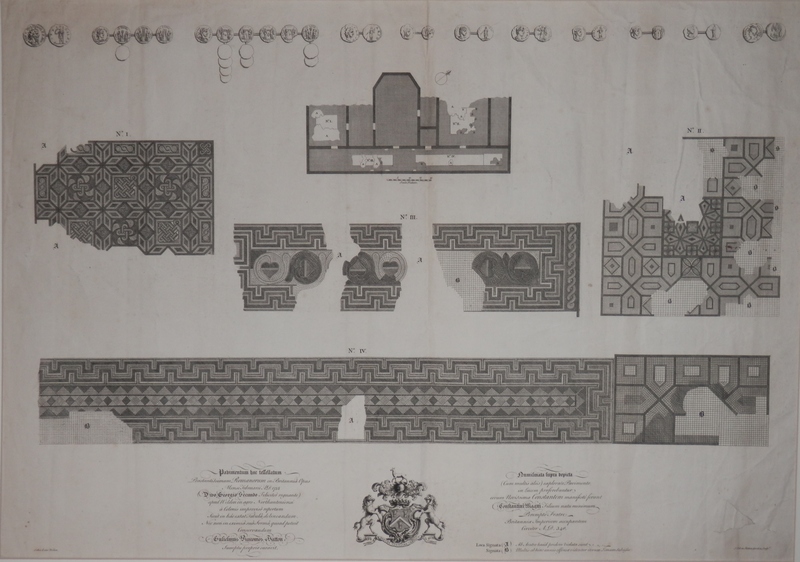 This entry was posted in Etching and tagged banner, Chevron, coat of arms, Hatton, helmet, mosaic floor, roman antiquity, stags, tiles, villa, Weldon Roman Villa. Bookmark the permalink.